Accounts of the great battle of the Barca Oasis are fragmentary. However from consulting various sources we can piece together the following facts. The Persian army lined up with the Arab camelry supported by horse archers on the left of the line, close order missile troops in the front centre and heavier cavalry and Persian and Assyrian chariots on the right. The close order infantry was held in reserve. 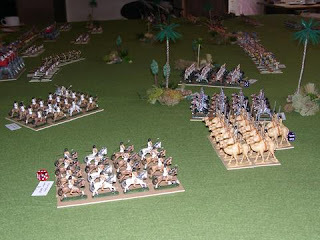 The Iranian strategy - outlined in an ancient electric rune despatched by one commander to another – was to utilise their superior fire power by advancing their close order missile troops towards the Carthaginian lines, and then executing a rather complex staged withdrawal shadowed by the cavalry. In such a way they hoped to blunt the greater weight of the Carthaginian infantry and drive the enemy elephants mad. The Carthaginians meanwhile put faith in the great grey beasts, who would punch a hole in the enemy centre through which would then pour the similarly wild, but altogether less disciplined Gaulish infantry. The two cavalry forces would – or so Bomilcar believed - simply cancel one another out. His heavy infantry would stay in reserve to protect the waterhole, which was, after all, the objective. The battle began with disappointment for the Persians. The camelry, whose vast swords promised mayhem on a Conan the Barbarian-scale, surged splendidly forwards in the manner of Peter O’Toole in Lawrence of Arabia. 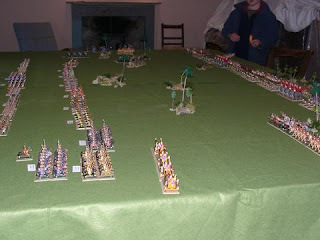 In response two units of Numidians galloped towards them, let loose a couple of flight of javelins and a handful of very favourable dice and the Arabs turned tail and ran. The sight of this galumphing rout of the lumpy quadrupeds caused a great cheer to group from the Carthaginian lines. Perhaps the Gauls thought the entire Persian army was in retreat, for at this point they chose to ignore all orders and charge a squadron of Persian chariots that had galloped the entire table length pecking ineffectively but irritatingly away at Bomilcar's slower moving troops from distance. One of the Persian chariots was over run and destroyed in the rush, but the others simply bounced away across the sand, firing as they did so. The Gallic pursuit continued, but now they were hopelessly isolated and in range of the massed Persian archers. His second wave of shock troops having gone too early, Bomilcar unleashed the elephants in an attempt to rectify the situation. On the right meanwhile things were altogether less exciting, the two groups of heavy cavalry surveying one another from distance, like boxers fearful that an attempt to land a knockout blow might result in their own destruction. The Assyrian chariots, did attempt action. Unlike the more circumspect Persians, however they wandered too near to the enemy and a surprisingly rapid charge by the Blues Shield Scutari saw vehicles, men and horses going down in a cloud of dust. On the left the Numidians, after their initial success against the camels, were now struggling to deal with the Dahae horse archers, whose superior missile range initially held the North Africans at bay and then drove them off completely. In the centre the crisis for the Persians was approaching. The elephants crashed into the first line of archers, making short work of them and bursting through towards the second line. Had the Gauls been following up in support as Bomilcar had originally intended they might have carried the day. Alas for him at this decisive moment the over enthusiastic Celts, already worn down by the missile fire of skirmishers and chariots, received a volley of arrows into their flank from the now rampant horse archers. All their howling bravado deserted them and they turned and ran back to the oasis. Isolated, the elephants battled gamely on until pierced by arrows they subsided trumpeting pitifully about the wisdom of trusting tattooed barbarians. By now any hope Bomilcar had of destroying the Persians was gone. His belief that he could hold the Oasis with his heavy infantry remained high, however. That might have been true had the Persians been armed only with shield and spear as his men were but now as the Persians advanced behind volley after volley of missiles it became clear to him that their archery and slingshots would, whatever he did, simply whittle his forces down. Determined to save the heart of his army for the next encounter he began a well-ordered withdrawal from the field. Exhausted and thirsty the Persians did not pursue. No doubt the Carthaginian senate will have some sharp questions for general Bomilcar upon his return to the city. Such as what was he thinking, to relegate his reliable heavy infantry to guard duty while assigning a key role to the volatile Gauls ? An enjoyable battle report as ever. Sounds like it would have been agood time for Cyrus's heavy armoured chariots for crashing into things.